Hey there, Spider friends! It’s your lovable hug-able host of Ghosts of the Stratosphere, Andy Larson, back again with another read pile entry. As I’ve mentioned before in previous read piles over the past couple of weeks, I’ve been review “Versus” stories here in September in memorial of our decision to put that segment of our podcast show on permanent hiatus. Too many friendships were nearly splintered, too many comic book related pint glasses broken in rage, it just wasn’t worth it. But that didn’t mean that I couldn’t still look for those stories out there first posed those difficult questions for fans and made them choose sides in a debate on which hero was in fact better. Thus far this month, I’ve been highlighting some lesser known entries to this sub genre of comics, but on this week’s entry, I thought I’d reach for that brass ring and talk about a “Versus” that nearly all self respecting geeks have probably heard about. That’s right! The Versus we all hope will eventually be made into a movie now that Disney is about to own the rights to all the characters: X-men vs. the Avengers! …Uh huh…well…fine then. I’ll write the damn article, but you can forget about getting a Christmas card this year! …Uh huh. Yes, I know that’s an empty threat. Uh huh. Beer and wings sounds fine for this weekend. Yeah, Nicole will make some sort of dip. I don’t know…some sort of cheese dip. Ok…ok…we’ll talk about this later, I gotta get back to my blog audience. Sorry about that folks, where was I? 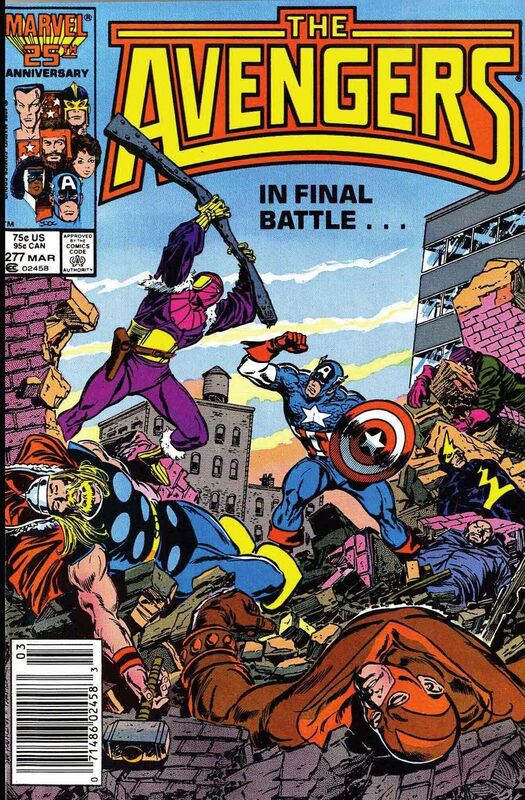 Yes, the break out crossover event of 1987, the X-men vs. the Avengers. Indeed 1987 was sort of a slow year for crossovers I guess. In any case, wedged between 1986’s Secret Wars II and 1988’s Inferno, Marvel put out a bunch of various Versus books all throughout that year that would pit a variety of different groups against their flagship team at the time, the X-men. There was this series where they fought the Avengers, there was another one where the X-men would fight the Fantastic Four, hell, there was a third one in which the X-men fought Mephisto. Actually come to think of it, I have that X-men vs. Mephisto in my read pile already. I should do that series for next week’s “Versus” entry. Ha! I love it when a plan comes together, but I digress. This series in which the X-men fight the Avengers occurs during a period in both books that many fans look fondly back on. The Avengers were experiencing somewhat of a renaissance under the guiding hand of Roger Stern with great stories like the Council of Kangs and most importantly, the Under Siege story (which we reviewed on this podcast). Yep, the only craptacular part of that run is the constant use of Dr. Druid, but overall it’s a pretty solid outing for the Earth’s Mightiest. I especially like the fact that he made a decent team out of characters like Black Knight and Monica Rambeau. Not to say they aren’t decent characters, but they are the type of characters that could have suffered in the hands of another author. Plus, he had to get creative with his team given half of the mainstays were over at the West Coast like Iron Man and Hawkeye. In any case, over at Xavier’s place, the X-men of this time were dealing with split of some of their original core members like Cyclops over to X Factor as well as the rebirth of Jean Gray. This coupled with the loss of Storm’s powers, the exit of Professor Xavier, and long standing arch villain Magneto joining the team made for some solidly memorable issues that many of fellow comic book readers who were kids at this time remember fondly. I won’t lie mainly because of that iconic Marc Silvestri art. However, its the last of those three other things I mentioned which is really at the heart and soul of this mini series: The continuation of the redemption arc of Magneto from reviled would be world conqueror to repetitive elder statesman for the mutant race. I mean from a plot perspective, there’s not much to this series other than that. Magneto’s orbiting base, Asteroid M, breaks apart and enters the Earth’s atmosphere. Magneto doesn’t want any remaining tech from the Asteroid to fall into the wrong hands and goes to retrieve a huge chunk that survived reentry. The Russian Version of the Avengers see this as an opportunity to capture Magneto and make him pay for blowing up a submarine of theirs in an earlier story. The real Avengers see this also as an opportunity to capture Magneto for past crimes and bring him before a world court for judgment. The X-men see this as an opportunity to test Magneto’s resolve that he has given up his evil ways and also tell these other groups to bugger off when it comes to policing the mutant community. A bunch of fights break out between all of the above. And yeah, that’s all this series is. Really just a bunch of fights. The Russians fight the X-men. 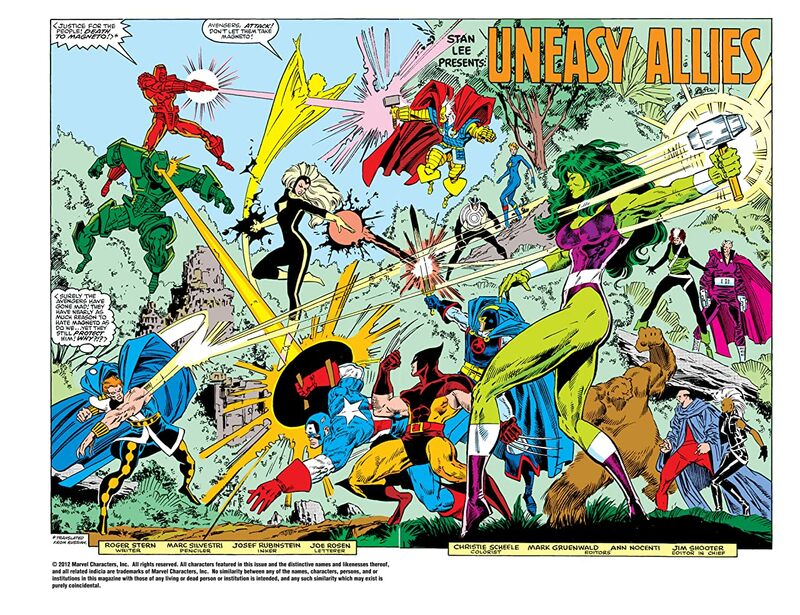 The X-men fight the Avengers. The Avengers fight the Russians. The fights happen on land and on a sinking oil tanker in the middle of ocean. I wish I could make that sound more exciting, but it’s really not. The fights to be honest aren’t really even that good. It’s not like what they would eventually do in 2012’s A vs. X series I mentioned before in that single Avengers and X men would just duke it out mono e mono. It’s more of a weird cluster with Monica Rambeau flying around everywhere, Captain America soap-boxing on the values of justice, and the Russians…well…interfering. Oh you know I couldn’t resist that. But the weirdest thing about this series is the complete and utter tonal shift that occurs in issue 4. I can’t really say its surprising given it was written by a completely different author in that Tom Defalco replaces Roger Stern (just like he did on Amazing Spider-man all of a sudden…interesting). But also the the artist changes, and the whole series goes from this slug fest battle between three competing teams of heroes to an intense courtroom drama. Yes, it all starts when Magneto refuses to be tried for his crimes because he feels anti mutant hatred will make it impossible for him to get a fair trial. So he blasts Captain America with mental mumbo jumbo to remove all bigotry for mutants from his mind and still see if he should be held responsible for his former crimes. After good ol’ Captain shows us once again the pinnacle of human fairness and justice by not having any anti mutant thoughts to begin with, Mags surrenders and puts his faith in the courts to give him a fair and impartial trial. From there, it’s mostly flashbacks of Magneto’s greatest hits as witnesses take the stand to chat up his past wicked ways. The entire time Magneto agonizes over whether he should use his anti mutant bigotry mind control to stop this farce of a trial and fix it so he will be set free. Y’know the whole once a super villain always a super villain. But I guess he’s justified as humans are shown everywhere hoping he’ll be put to death so that it with stir up anti mutant hatred to levels where there will be a push to eradicate them forever. That’s some deep dark stuff, Mr. Defalco, I will give you full credit for that. And in the end is Magneto convicted of his crimes? Nope. He does reluctantly end up using his mind control helmet to change the mind of the chief justice and is instead granted statehood. Since states can’t be held accountable by a world court for declaring wars on other states, Magneto can’t either. So Magneto is a state of one person? So if you commit murder, you’d just have to say “Hey I was Nebraska at that time” and you’d get off scott free?? I’m not sure Tom Defalco was a lawyer, but I definitely think one of our Avengers in this book is. She Hulk, what did you think of that verdict? I mean I could have bought the argument that they use for Doctor Doom that because Magneto works out of Asteroid M instead of a country, he has sovereign immunity. Sure that’s totally copying the Dr. Doom defense word for word, but at least it would make more sense than this. I don’t wanna piss off Magneto so whatever he wants to do, he can. If superheroes want to stop him, great! I’m late for dinner. Please don’t drop a battleship on my house. Yeah, I know that sounds real silly, but honestly it’s no more silly than most of this mini series. I really did have high hopes for this given it was Roger Stern at the helm and traditionally I do like his stuff. But I’m sorry, it seemed like some company mandated phoned in tripe, with a tacked on left turn of an ending with the Defalco 4th issue, I dunno. I mean, I read somewhere that Roger Stern was pissed that Defalco “ruined” his Hobgoblin build up in Amazing Spider-man by revealing it was Ned Leeds. Maybe this was the same thing in which if Stern had got to write the 4th issue himself, we would have gotten something that didn’t seem so out of place. Maybe. Probably. Eh…I doubt it. I mean look at those first 3 issues. Nothing of importance happens. Magneto goes salvaging his former orbiting house boat and a bunch of heroes squabble like chickens over whether or not anyone should stop him. Compared to the later Avengers vs X-men series which dealt with Phoenix Force driven extremism, whether mutants had the right to live, and the drowning of Wakanda, this seems like mostly forgettable nonsense. The only serious discussion topic comes out of that final issue, where humans seem empowered to attack and kill mutants because of the publicity the Magneto trial and the anti mutant feelings that are stirred up out of seeing this former mutant super villain walk instead of receiving his comeuppance. That I feel does have some relevance in our own society and is again a strong warning against the prejudice and hatred that can come from judging the many because of the actions of a few. Again, I give Tom Defalco full credit for discussing that in that final issue as its one of the few gems of clarity. In closing, I feel like I definitely would have rather reviewed the 2012 Avengers vs. X-men series than this one. There was definitely more eventful substance in that series. The phrase “meat on the bone” springs to mind. This 1987 series on the other hand is probably best left ignored even by fans that enjoyed this era in general of either the Avengers or the X-men. There’s just not much here, and what is, seems uneven and unremarkable. Resurrecting Resurrection Man from the Bargain Bin!